Hermès is one of the world’s most successful luxury craft brands. Since its birth as a saddlery in mid-nineteenth century Paris, the company has appealed to the elite. It’s a chance to continue our dialogue between love and money. Unlike most other designer brands, luxury craft proudly presents its production process, showing off the technical skills of its makers. 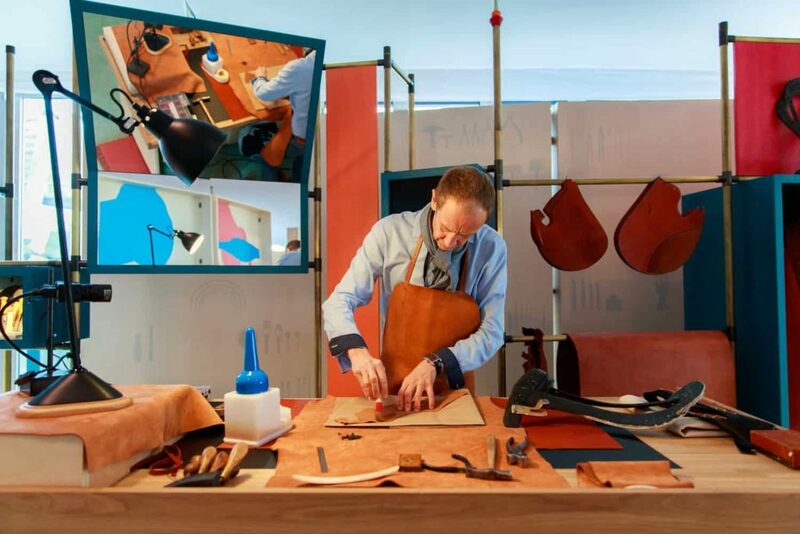 The exhibition Hermès at Work is touring the work with demonstrations from its artisans. The exhibition is now in Australia, which opens up important issues about this form of craftsmanship on the other side of the world. As a British settler colonial nation. Australia has defined itself against European aristocracy. Craft in Australia tends to be a more common pursuit, indicating wholesomeness and a personal touch. There isn’t the same culture of the “master” as those with a strong courtly tradition. What goes as contemporary craft in Australia often embraces humble materials, reflecting the nation’s evolution from a criminal to middle class. Through these antipodean eyes, Hermès may seem part of an elite conspiracy to wrest craft from its ordinary enjoyment. Yes, there is much to be said for the importance of wealth to high-end craft. It is generous collectors who stimulate craftspersons to achieve excellence and originality. Collectors may even see themselves as patrons of a craft, serving to sustain traditional skills. As a company, Hermès seems to invest seriously in the skills of its makers. The Garland article by Lou Weis reflects the critical role of the patron in generating innovation in craft and design. While their motives may sometimes be egocentric, an effective curator can channel their ambitious to support genuine creative development in the medium. Nonetheless, there are few figures like Lou Weis in Australia and collectable craft and design remains a rare phenomenon. Luxury craft has a renewed value today with increased awareness of the environmental damage caused by fast consumption. Like all good craft, Hermès products are made to last and do not have inbuilt obsolescence or dependence on the fashion cycle. While it may seem exclusive compared to cheaper products available in department stores, it is worth factoring in the lifespan of these objects. Nevertheless, the arrival of the Hermès workshop to Australia may prompt us to think of the diversity of craft worlds. There will always be a place for luxury craft, just as Paris will continue to be an icon of beauty in our world. For a country like Australia, the challenge seems to come from the other end – the bottom of the hierarchy. For this modern nation, the Hermès show may give pause to consider its own craft heritage, such as whip braiding, boat-building and even surfboard making. For Australians, the good life might be more likely found on Bondi Beach than the top end of town. Seeing Hermès at work may prompt appreciation of unique craft values in its host venues. World Crafts Council – Australia is offering members the opportunity of joining a tour of the Hermès at Work exhibition on Sunday 11 March. See details here.